Noir is a newish restaurant in Swan Street Richmond - previously home to Flavours of Lakhoum. We were pointed to Noir by trusted F.O.E (friend of eat) Jay who also gave us the good word on Osteria la Passione. The chef behind Noir is Peter Roddy and he has worked with Ramsay and Roux in the UK so you do come here with some expectations. 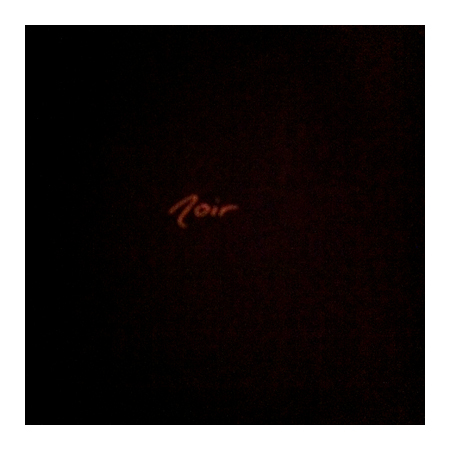 Noir does live up to its name - black and wooden walls with bare wooden tables means that at night it is especially dark inside which can be illustrated by this dismal photo of the noir menu. It really isn't worth the effort to try to take photos even though the food was particularly photogenic, so breaking with routine, this will be a post about food without photos. There is an a la carte menu but the focus is on sharing dishes and they are listed as smaller or larger plates. Another option is the "surprise tasting menu" at $70 a person - which is basically, you get what the chef decides. As this is our first time here, we gone for this option. The meals starts with slices of warm bread served with butter and a roasted garlic & rosemary infused oil. First dish out was Pacific Oysters with Champagne granita - two good sized oysters topped with a large dollop of champagne granita and served with a lime wedge. A refreshing way to start. Next up, Salt Cod croquette with lime mayonnaise - the croquettes were plump with salt cod, delicous. A real star of the meal, Steak tartare, quail egg, waldorf salad - a dish that I wish I could have photographed. Served on a beautiful black slate Revol plate, it was a dish in three. On one end of the plate, a pile of perfectly buttery and crisp bread on the other, a thick disc of beef tartare topped with soft poached quail egg. In the center the waldorf salad - concentric discs of wafer thin apple slices each layered with the finest dice of celery and walnut bound in dressing. A dish neither of us wanted to share - it really was that good. Next up, Hendrick Gin cured Ocean trout, cucumber granita, picked cucumber and rose creme fraiche Generally I'm not a huge fan of anything rose flavoured but in this dish it was used to good effect, just enough to harmonise but not overpower. Enjoyed the texture of the trout, firm to cut yet soft in the mouth. This was followed by a warm heirloom beet salad with rocket, tiny goat cheese filled beignets, shards of confit duck leg and roasted walnut. One more of the "smaller plates" followed - two beautifully seared scallops accompanied by cauliflower puree and oxtail tortellini. The main was was suckling pig - an assortment of different cuts, belly, cutlet, loin, served with hazelnuts and parsnips. Cheese followed - in this case, Roquefort served with plum chutney and finally dessert - Cream brulee studded with apple crisps and served with a cucumber soup. We tumbled out of the restaurant feeling quite happy - the quality of the cooking was top notch and for the price, it's actually a steal. One other thing to remember is that currently it's just BYO and corkage is a very reasonable $5.